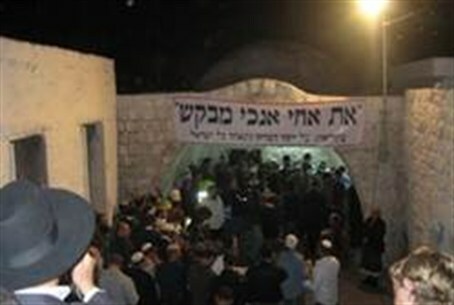 More than 3,000 Jews prayed at Kever Yosef (Joseph’s Tomb) Tuesday night with Holocaust survivor Rabbi Menachem Mendel Taub. The event coincided with “Ushpizin Yosef,” following the tradition of inviting the presence of Avraham, Yitzchak (Isaac), Yaakov (Jacob), Moses, Aharon, Yosef and King David on each of the seven nights of the Sukkot holiday. Rabbi Taub, known as the Kaliver Rebbe and who is over the age of 90, lost most of his family in Auschwitz. He is known as one of the greatest commentators on the Holocaust and encouraged saying the Shema prayer in commemoration of martyrs of the Holocaust at the end of religious events. He also is trying to establish a Holocaust museum for the hareidi religious community. Shomron Regional Council head Gershon Mesika recalled that the Oslo Accords called for Kever Yosef to remain under Israeli sovereignty. MK Danon, who is the leader of the World Likud, “I believe that in future years we will be able to tell our children that we came here only at night and they won’t believe it because it will be so simple for everyone to arrive freely." During the Sukkot holiday last year, the monument to Yosef was restored after having been destroyed by the Palestinian Authority. The operation involved a difficult maneuver of building and restoring the five-ton monument at the site.